this weeks challenge is really fun....you guys seemed a little shy abouut the hometown challenge so maybe this one will entice you a bit. Did you think the entire LMLC DT was gonna show up at your house or something???. Most of us are fairly well behaved, honest :) I wo'nt tell you which ones,....that would ruin the surprise........lol. 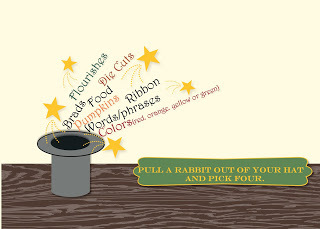 Pick 4 of the following elements from the magic hat!! And for my layout I chose to add another one to my cousins Christmas present.....a huge scrap album of pages of her baby girl and her family.....I'm nice like that :) And this one is the whole crew!!! Her hubbs Rob, and her daughters Beth and Nevaeh and of course Tonya :) We haven't seen each other since we were both kids........and we are definitely planning a reunion sometime after the holidays....we found each other on facebook and I am so thankful!! Her and Rob are even talking about moving down this way in a year or so because they have visited the mtns several times and just love it here!! It would really be cool to have family living nearby. At least this part of the family........lol. And you know I wanna spoil that baby girl!!! Prima crystal flourishes and LOTS of Prima flowers....it killed me to use the entire package of both....lol. BUT they were from a prize package so that lessened the sting a bit ! Ribbon and food......there is an apple in the word "love"
And of course I used words and lots of orange. So........who wants to dig deep into the hat and pull out a few surprises this week?? You just have to use four!!!! Easy stuff!!! I'm also sharing this with the Scrap Friendzy crew........we are STILL celebrating our 5th birthday with lots of fun challenges!! So Very Thankful 4 U.......hope that works.....lol. There are tons of birthday bash challenges going on and you have ALL MONTH to complete any of them!!! It's worth checkin out!!!! I'm also linking up with the following,,,,,,,,thanks so much for visiting my blog today!! Ohhhhhhhhhh your lo is beautiful!! I loveeeeeeeeeee the photos and loving the colors!!!! Tina, what a FAB job, you did with adding more photos! LOVE IT! Another A+!!!! What a happy LO! Lovely! Wonderful work! Thanks for joining the Tie A Ribbon Challenge at Southern Girls! too pretty!!! aren't baby girls sweet? wow... once again love your pages!! Oh Tina, I so love how you sed the daisies to surround her kissing the baby:) Very sweet! 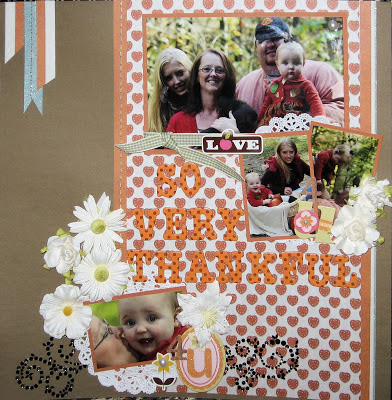 Did you survive the invasion of kids on your scrapbooking time?